By now, we’ve identified our cause, developed a clear target for our petition and worked to craft the strongest message possible. Now it’s time to fine-tune the details before we go live. Care2 Petitions’ easy-to-use petition tool guides you through the steps to building a strong message. As you fill in all the details, refer to this checklist before you publish to make sure that you hit the ground running! ▢ 1. Does your petition have a strong headline? Write three to five possible titles and practice saying them out loud to see which one resonates best. Shoot for titles that are less than 70 characters in length. ▢ 2. Does your petition have eye-catching visuals? Remember, a picture can communicate a message in ways that words cannot. ▢ 3. Does your petition body have a clear opening statement? If you only have 30 seconds to convince someone about the importance of your cause, what do you say? In a sentence or two, tell your future supporters why your position is the right one and also that help is needed! ▢ 4. Have you confronted the opposing views? Don’t shy away from your opponents’ views. Acknowledge the other viewpoint and use that information and honesty to explain why your petition addresses the greatest good for all involved. ▢ 5. Have you made your petition summary as complete as possible? An introduction paragraph that states why your solution is the best option. One or two supporting paragraphs that include research, quotes and a list of other organizations already in support. A closing paragraph that reiterates that your solution is the best option. ▢ 6. Is your petition written in an active voice with clear language? We strive to stir action in our targets and our supporters. Now is not the time to speak passively — NOW is the time for simple and direct communication! Make sure your writing actively addresses the issue at hand and what someone can do to change it. ▢ 7. Have you proofread your statements? Nothing runs the train off the tracks quicker than sloppy writing and editing. Is all your information accurate? Don’t give your opponents a reason to discredit your entire cause — don’t sacrifice facts in order to exaggerate your call-to-action. ▢ 8. Have you narrowed your targets? Make sure your targets for the petition are clearly defined, and that you’ve identified who will stand in support. ▢ 9. Is your petition easy on the eyes? Today, people are all too apt to take a look at a big chunk of words and gloss right over it. “TL; DR” (too long; didn’t read) is a common response these days. Keep it short and sweet! 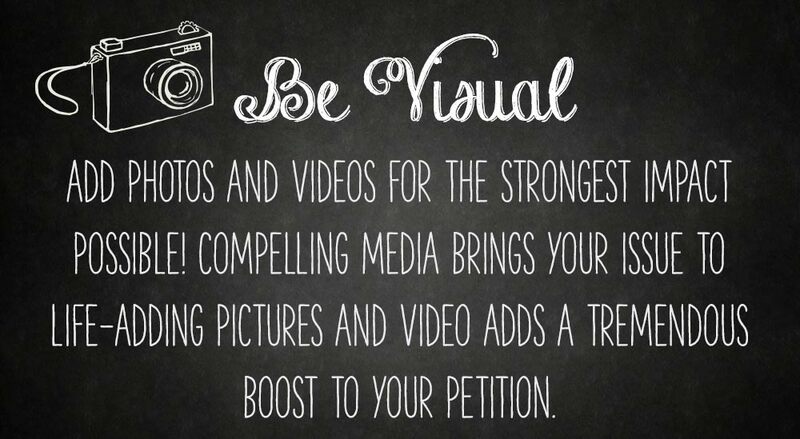 This not only helps you to hone your message, it encourages people to read your petition. Start by writing a rough draft and then breaking up paragraph text by using bullet points. ▢ 10. Is your petition optimized for search engines? Will someone searching online about your cause find your petition? Incorporate key words, but don’t go verbally overboard. Always remember that our staff at Care2 reviews your petitions every day! We work hard to promote the issues that matter most to you and offer tools and tips to help you get the word out. Of course, you don’t have to wait for us to approach you! We always encourage petition authors to reach out to us to ask for help! Are there other groups willing to help you as well? Read on for part 6 of our series, outlining the best ways to partner with groups and organizations to continue to propel your cause toward recognition and resolution!